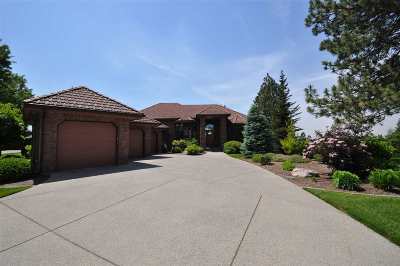 5426 S Quail Ridge Cir, Spokane, WA.| MLS# 201913305 | Cooper Realty Services (509) 599-1111 | Spokane WA Real Estate | Contact us to request more information about our Homes for Sale in the Spokane WA area. Custom Quail Ridge home by renowned architects/builder âone of only a few homes in this exceptional South Hill community that is on the bluff. Over 6100 sqft of luxury, stone & hardwood flooring, floor-to-ceiling windows, gas fireplaces, & chef's kitchen w/high-end appliances. Incredible master en suite. All main floor living (master/laundry/garage). Heated 3 car deep garage system. Full daylight basement w/fitness room & hot tub. Both floors have wrap-around decking to take advantage of the sweeping views!